No official detectives registered in Korea. July. 11, 2018 08:17. by Dong-Yong Min mindy@donga.com. “God, help my poor soul!” This was the dying words on October 7, 1849 by Edgar Allan Poe, who is known as the “father of detective novels.” American detective novelist Ellery Queen once said that Poe established all of the main principles of modern detective novels. From Sherlock Holmes to Detective Conan, detectives have long been an element of popular culture. No gap between a novel and reality is bigger than detectives. 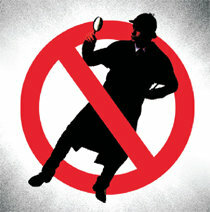 There are no detectives (private investigators) in Korea. Article 40 of the Credit Information and Use Act prohibits a person other than a credit information company from finding out a certain person's whereabouts and contacts or investigating his/her private life, other than commercial transaction relationships, including financial transactions. The word detective cannot be used as well. Instead, entities, such as private messenger office or inquiry agency and investigation on life, exist. The main duty of these entities is not solving cases with spectacular reasoning. Most of their cases are capturing an affair of someone’s spouse. They extract information illegally by using hidden cameras or automatic vehicle location devices and intimidate or threat people. Korea is the only country among the 36 OECD member states where detectives are not systemized. Most countries including the United States, which is famous for the first private detective agency called Pinkerton, Australia, and the United Kingdom, operate the detective system based on license system. Japan, where the first “commercial inquiry agency” was established in Osaka in 1892, exceptionally practices a report system. People can become detectives after receiving some two weeks long training at institutions such as private detective academy. Currently, about 60,000 people work as detectives in Japan. A legislation that guarantees detectives by law has been proposed at the National Assembly for seven times since 1999 but was not passed as there was serious concern over violation of a person’s private life through taking advantage of credit information. There was also a conflict of interest with the police agency, the Ministry of Justice and lawyer groups. The Constitutional Court unanimously decided that Article 40 of the Credit Information and Use Act was legal and dismissed a constitutional appeal filed by a former police officer that Article 40 violates the freedom of choosing a vocation. Domestic “detectives,” which amounts to 5,000 to 10,000, would lament over this decision. It is somewhat, however, a natural consequence as these so-called detectives failed to put an end to disputes over invasion of privacy.